If there is one room that sticks out in our mind when thinking of lacquered walls, it would be the Brooke Astor’s red library done by Albert Hadley. It is the quintessential room that is perfectly balanced with highly dramatic walls and classic prints and design elements. It was done beautifully then, and is still a classic trend that brings walls to life and gives an opportunity for change from the standard flat paint finish. Painting a room in a lacquered finish is a technique designers from Alex Hampton to Billy Baldwin have made popular. The high gloss effect adds instant drama and gives an air of elegance to a space. The way light shimmers off lacquered walls at night in a room is impossible to achieve with any other finish. 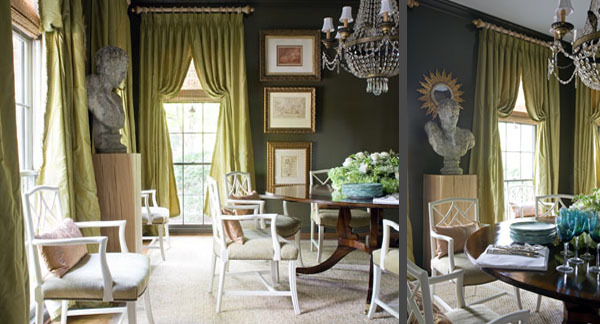 The technique is most appropriate when using darker colors and is almost magic when used in a room like a dining room or powder room and accentuates every aspect of the room around it. We used the high gloss finish in both of these dining rooms and the outcome was exactly what we had intended for the spaces: glamourous and unexpected. 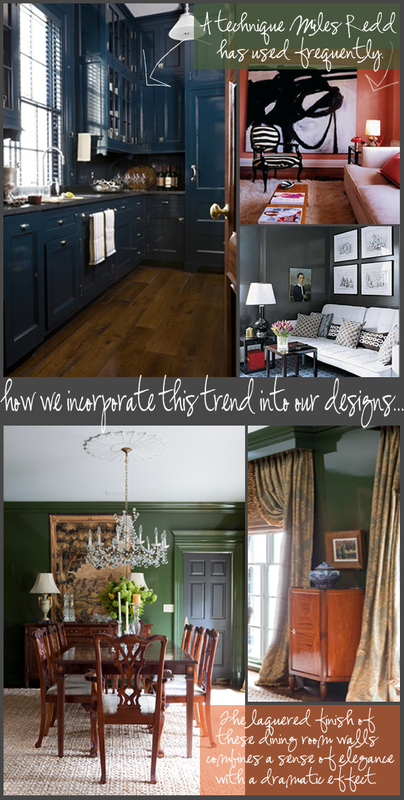 One thing to keep in mind when incorporating this trend into your home is the condition of your existing walls. They must be in good shape to pull this look off, otherwise, this finish will show every flaw. Also, it’s important to keep the level of sheen consistent, so be sure to include your trim and base in the same paint.